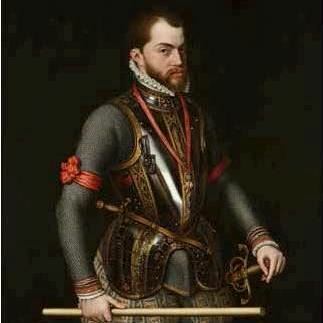 Philip as King of Spain(1556–98), King of Portugal (1581–98), King of Naples and Sicily (both from 1554), and jure uxoris King of England and Ireland during his marriage to Queen Mary I from 1554–58. A devout Catholic, Philip saw himself as the defender of Catholic Europe against the Ottoman Empire and the Protestant Reformation. He sent a large armada to conquer Protestant England in 1588, with the strategic aim of overthrowing Elizabeth I of England and the establishment of Protestantism in England. He hoped to stop both English interference in the Spanish Netherlands and the harm caused to Spanish interests by English and Dutch privateering. The humiliating defeat of the Spanish Armada in 1588 was a disaster for Spanish prestige and marked the beginning of the ascendancy of the English Royal Navy as master of the seas. Besides Mary I, Philip was married three other times and widowed four times. He died in 1598.